Located at the crossroads of many ancient civilizations, Turkey is a haven for archaeology lovers. Over the centuries, a succession of empires and kingdoms – Hittite, Lydian, Persian, Greek, Roman, Byzantine and, finally, Ottoman – ruled over Anatolia. The country’s unique cultural legacy, its remarkably beautiful landscape as well as the friendliness of its people make visiting Turkey a rewarding experience. The country is scattered with so many archaeological wonders that each visit always seems too short. I have myself come back several times discovering one fascinating place after another. 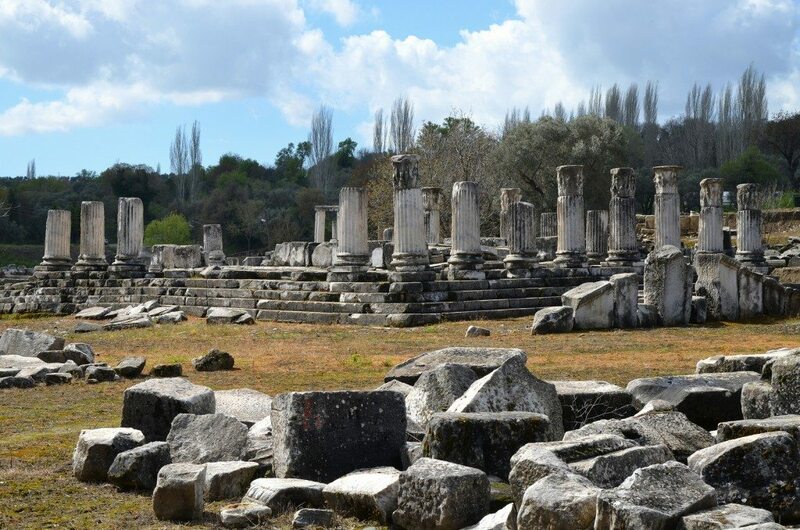 Having visited most of the great classical sites in western Turkey, I invite you to discover the ancient treasures of Caria, a region of considerable historical importance and geographical diversity. Some sites, such as the coastal city of Miletus and the oracular sanctuary of Didyma are already familiar to the modern visitor. Other lesser-known ancient cities that are no less spectacular are to be found inland, in relatively remote areas. Caria is the name given during ancient times to the south western region of Anatolia’s Aegean shore in Asia Minor, present-day Turkey. 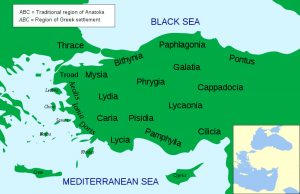 Caria’s neighbours included Ionia in the north and Lycia in the east whereas nowadays it mostly covers the Muğla province. Its inhabitants were the Carians and the Leleges (the descendants of the Carians). Even though Carians are mentioned frequently in ancient literature, their history is still largely unknown. In the Iliad, Homer writes that they fought against the Greeks as allies to the Trojans. The historian Herodotus, who was born in the Carian city of Halicarnassus, describes them as fierce, seafaring warriors and as being of Minoan descent. However Pausanias, the intrepid Greek traveler of the 2nd century AD, tells that the Carians were the former inhabitants of the land and that colonists from Crete mixed with them and adopted their name. The Carians themselves thought that they were indigenous people of Asia Minor. The region took an important role as its location allowed the Carians to dominate the sea routes. After serving as mercenaries during the reign of the Egyptian pharaoh Psammetichus I (664-610 BC), the Carians were entirely subjected to the Lydians before they fell to the Persian advance. Caria was then incorporated into the Persian Achaemenid Empire as a satrapy in 545 BC. During the Persian occupation Caria was ruled by satraps who were subject to Cyrus the Great. The most famous of the Carian rulers was King Mausolus who reigned over the region in the 4th century BC (377–353 BC). His tomb came to be known as the Mausoleum, one of the seven wonders of the ancient world . In 334 BC, Caria was conquered by Alexander the Great and with the aid of Ada of Caria (sister of Mausolus), he soon had the region firmly under his control. Ada adopted Alexander as her son and surrendered the city of Alinda to him. After Alexander the Great’s rule, the country became part of the Seleucid Empire and later of the Kingdom of Pergamum. Eventually Caria was incorporated into the Asian province of the Roman Empire with the rest of the Pergamum Kingdom when Attalus III (170-133 BC) bequeathed his kingdom to the Romans. 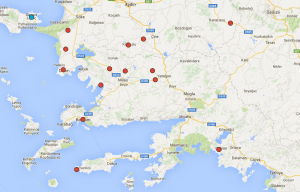 The Romans conquered the whole area in 42 BC. The name of Caria was still used for the geographic region but the territory administratively belonged to the province of Asia. 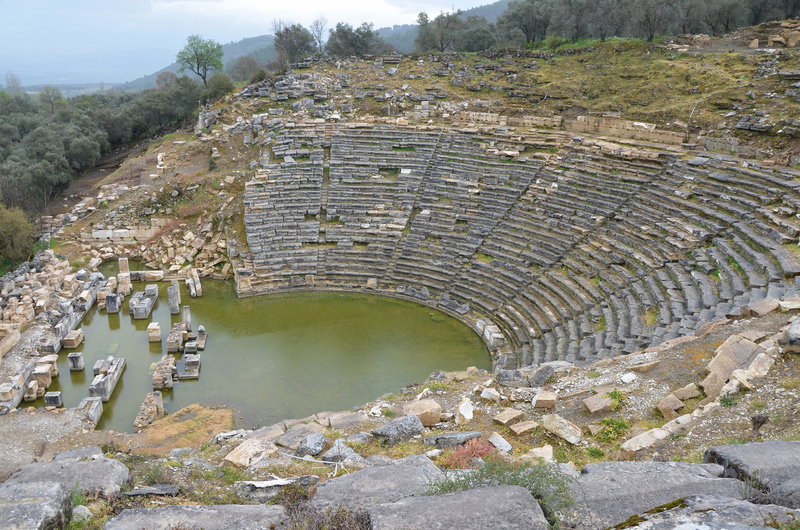 Here are 10 hidden ancient sites to explore in Caria. 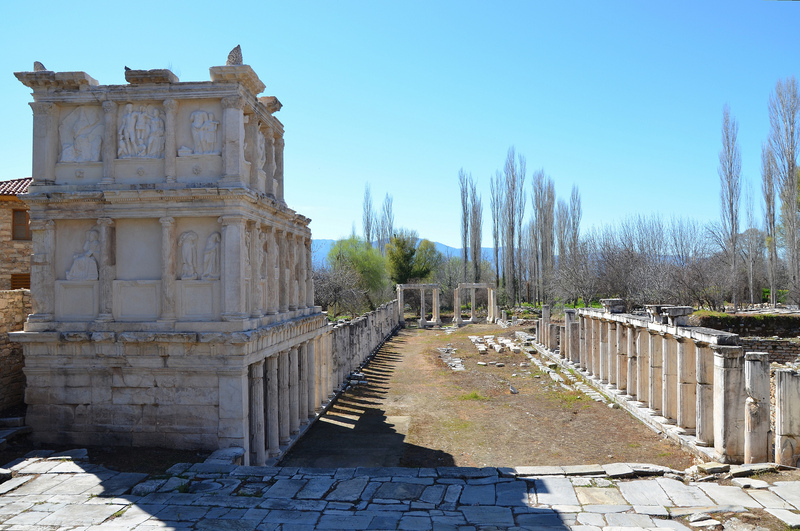 The beautiful ancient Greek city of Aphrodisias, still partly excavated, is one of the most important archaeological sites of the late Hellenistic and Roman period in Turkey. 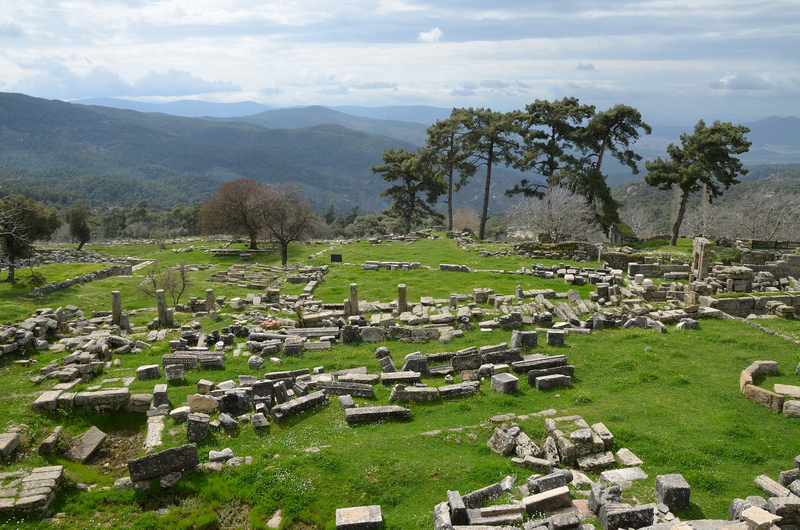 The city was located in inland Caria on a plateau 600 meters above sea level. Today it lies near the village of Geyre, some 80 kilometers west of Denizli. The city was founded in the 2nd century BC on the site of an earlier shrine. It was famous for its sanctuary of Aphrodite, the city’s patron goddess, as well as for its sculptural school which rose to prominence under the emperor Hadrian (117-138 AD). The imposing Aphrodisias Tetrapylon, a monumental gate composed of four groups of four Corinthian columns leading to the Temple of Aphrodite. It was constructed in the 2nd century AD and was decorated with relief depictions of Nike, Eros and animal figures among carved acanthus leaves. 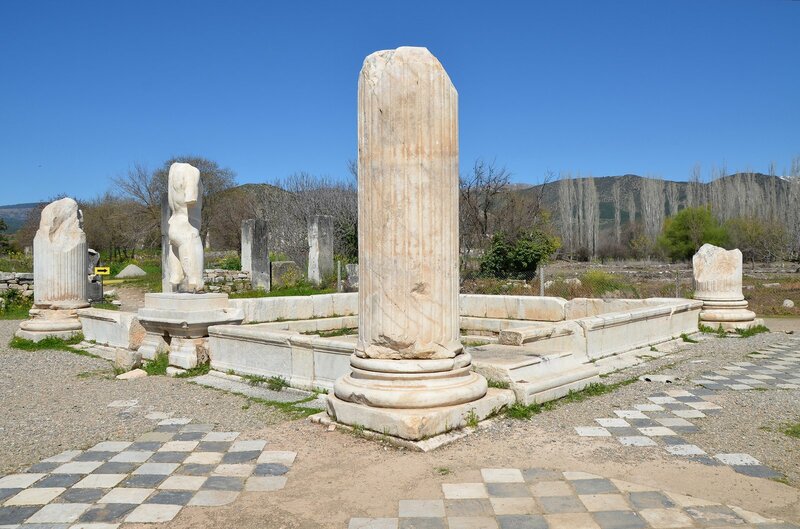 Aphrodisias enjoyed a long period of prosperity from the 1st century BC onwards when it came under the protection of Augustus. 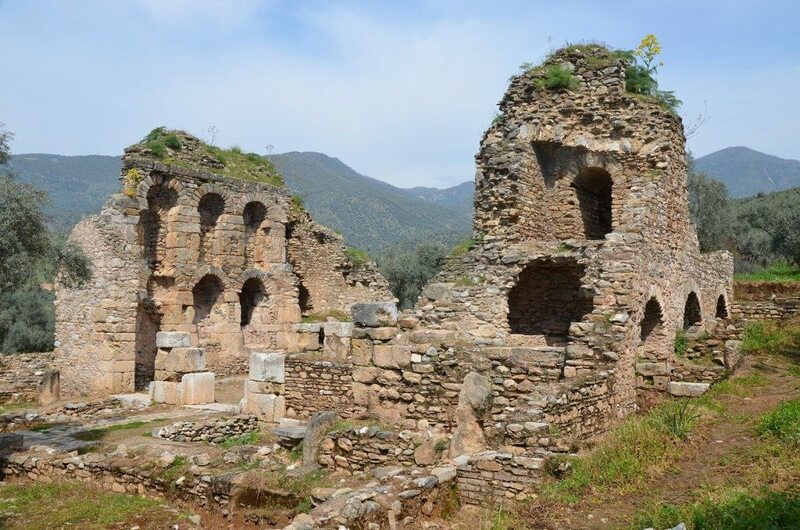 In the 5th century AD, it gradually faded into obscurity, later becoming the Turkish village of Geyre. The ruins that remain today reflect this wealthy past. 20th century excavations have unearthed most of the major public monuments of Aphrodisias: the Temple of Aphrodite, the theatre, the large Agora with its associated bouleuterion (council house), the bath complex, the stadium and the Sebasteion, a temple complex dedicated to Aphrodite, Augustus and the Julio-Claudian dynasty. The Ionic columns of the Temple of Aphrodite at Aphrodisias, later converted into a Christian basilica. 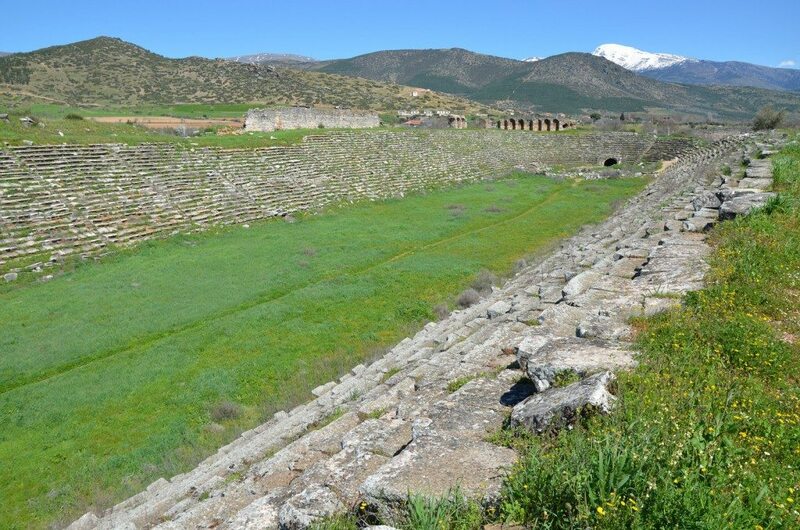 The Aphrodisias stadium, dated to the 1st century AD. It is the best-preserved stadium in Asia Minor. The stadium is 262 m in length and 52 m in width, with a seating capacity of 30,000 people. General view of the Sebasteion with the restored portico with replicas of reliefs depicting various mythological subjects and members of the imperial family. Its construction began during the reign of Tiberius (14-37 AD) and was completed in the beginning of the reign of Nero (around 54-68 AD). 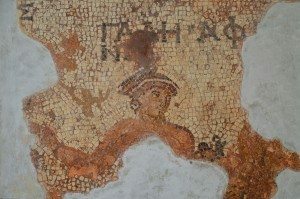 Mosaic fragment depicting Aphrodite. It was in the Bouleuterion and dates to the 2nd century AD. 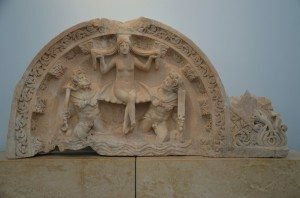 Relief depicting the birth of Aphrodite. 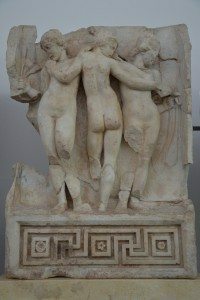 Relief from the Sebasteion depicting the Three Graces in a typical Hellenistic style. 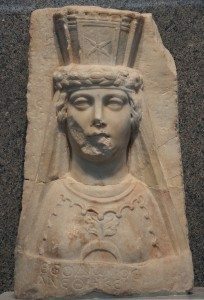 Bust of Aphrodite, the protectress of Aphrodisias, depicted with a headpiece in the form of ciry ramparts. It was found in the theatre and dates to the 2nd century AD.s, from the theatre, 2nd-3rd century AD. 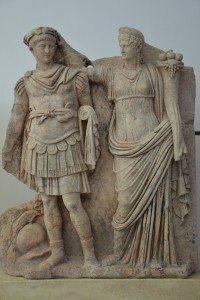 Relief from the Sebasteion depicting Nero and Agrippina on display in the Aphrodisias Museum. Agrippina crowns her young son Nero with a laurel wreath. The scene refers to Nero’s accession as emperor in 54 AD. Labraunda is the home of the Sanctuary of Zeus Labraundos and is located in the mountains overlooking the plain of Milas. 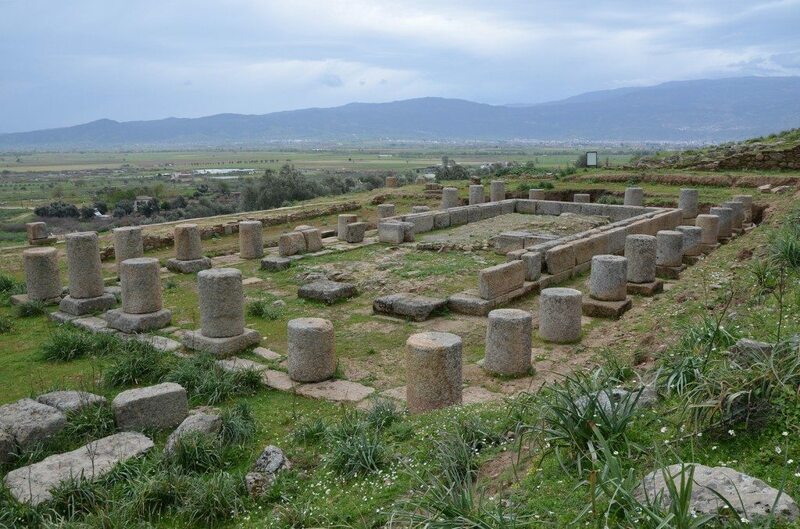 It was the most important sanctuary in Caria, especially in the 4th century BC when King Mausolus, the satrap of Caria, made Labraunda his family sanctuary. 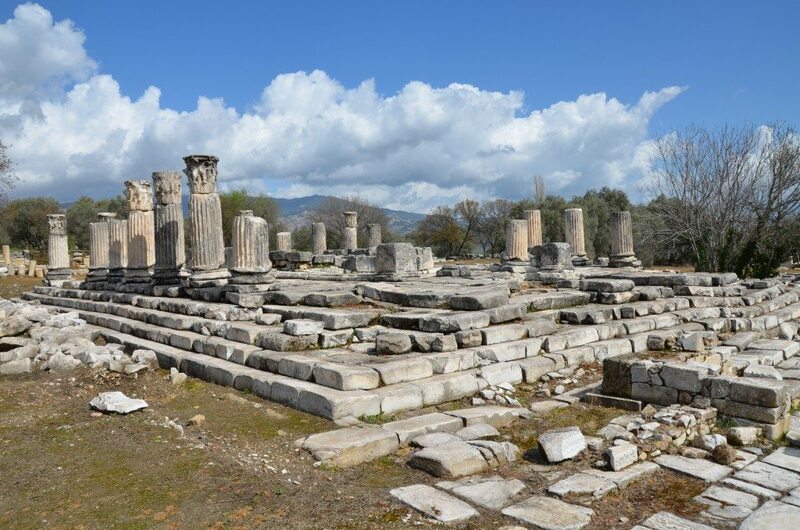 The remains, dating to the 5th century BC and 1st century AD, include the Temple of Zeus, two large Andrones (ceremonial dining halls), two stoas, two Roman baths, several priests’ residences, and a nymphaeum. 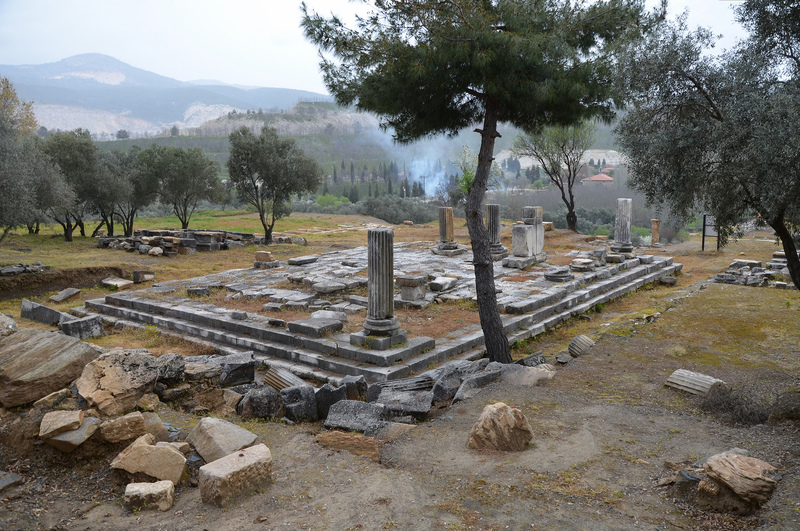 The Temple of Zeus built in the 4th century BC with the Andron A (banqueting hall) in the background. The cult of Zeus Labraundos, whose attribute was the double-headed axe, may have originated in the 7th century BC at a spring just above the temple terrace. It is quite possible that Labraunda was first seen as a sacred place because of the remarkable rock above the sanctuary. It has the appearance of having been split in two by a thunderbolt. Moreover, the sacred spring is located just below the split rock. The North Wall of the Propylon area and the monumental staircase leading up from the entrance. Note the huge Split Rock in the background which may have been the inspiration for the establishment of the cult to the Carian sky god. The site was situated on a rather steep slope so the buildings were constructed on a series of five artificial terraces. It was linked to the city of Mylasa (modern Milas) by a 7.5 m wide, paved Sacred Way. A 5-day long sacrificial feast was celebrated here every year. 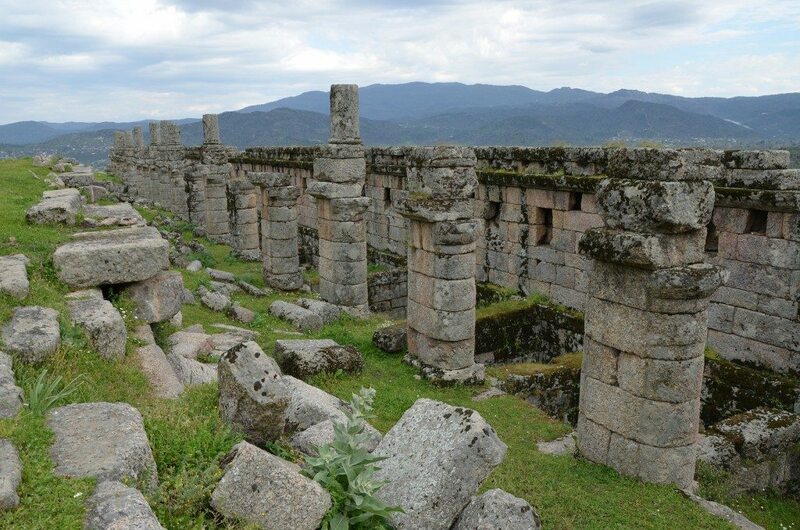 View of the Temple Terrace of the Sanctuary of Zeus Labraundos at Ladraunda. The Sanctuary of Zeus Labraundos overlooking the plain of Milas. View of the different terraces of the Sanctuary of Zeus Labraundos at Ladraunda. Known in ancient times as Halicarnassus, the city of Bodrum has become a hub for tourists on the southern Aegean coast. 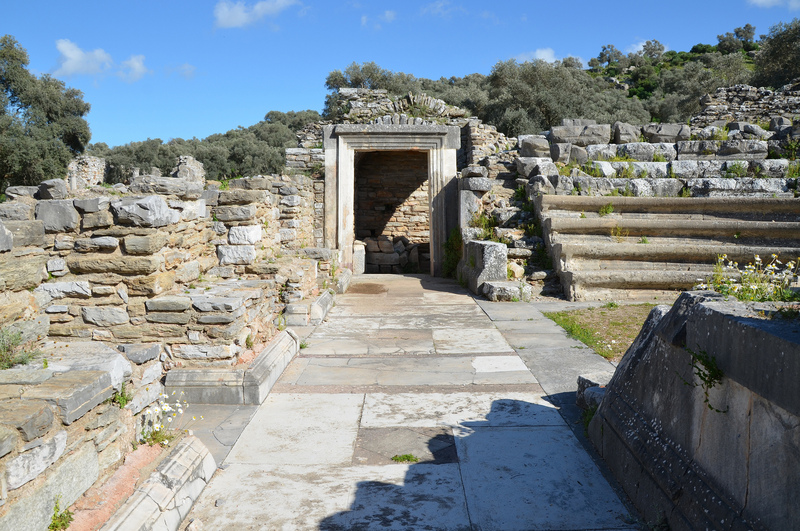 It is also the home of one of the Seven Wonders of the Ancient World, the Mausoleum at Halicarnassus. 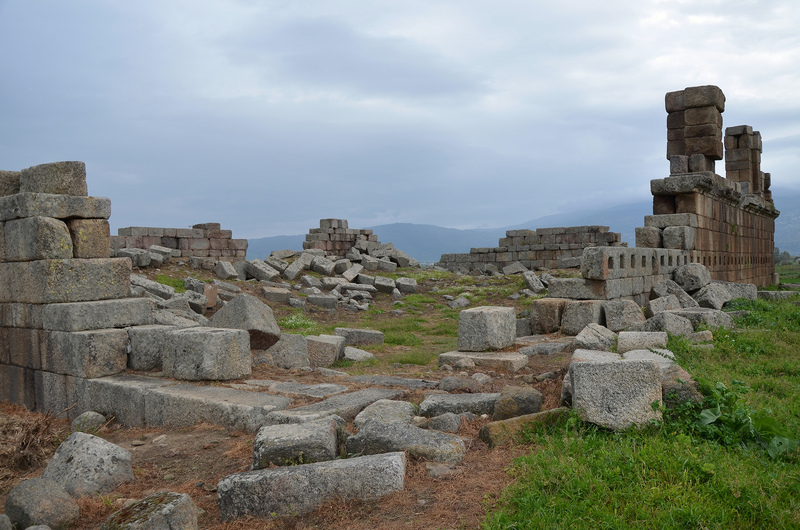 The ruins of the Mausoleum of Halicarnassus, constructed for King Mausolus during the mid-4th century BC at Halicarnassus in Caria. The Mausoleum was built as a tomb for the Persian Satrap Mausolus, a member of the Hecatomnid dynasty who governed Caria from 377 to 353 BC. Mausolus moved his capital from Mylasa to Halicarnassus. He founded many cities in the Greek model and encouraged Greek democratic traditions. 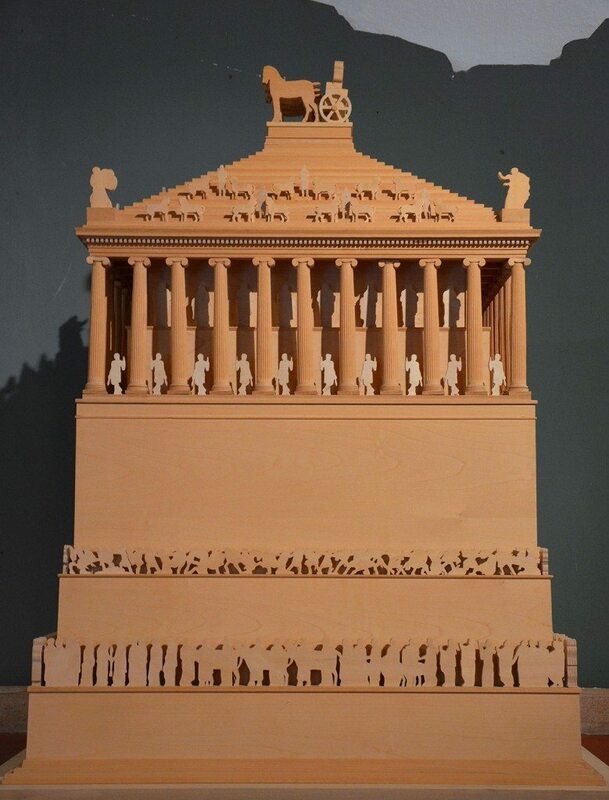 Model of the Mausoleum of Halicarnassus. When Maulosus died in 353 BC, his queen Artemisia (who was also his sister) decided to build him the most splendid tomb in the known world. It was an elaborate tomb 135 feet (41 m) tall and ornately decorated with fine statuary and carvings in relief. It was destroyed by a series of earthquakes and stayed in ruins for hundreds of years until it was completely dismantled in 1494 and used by the Knights of Malta in the building of their castle at Bodrum. The modern word for a monumental tomb “mausoleum” derives from the Latin form of Mausolus’ name. Many statues and reliefs from the Mausoleum were carried to London’s British Museum in 1856 where they have been on display since then. At the site of the Mausoleum only the foundation remains as well as a small museum. 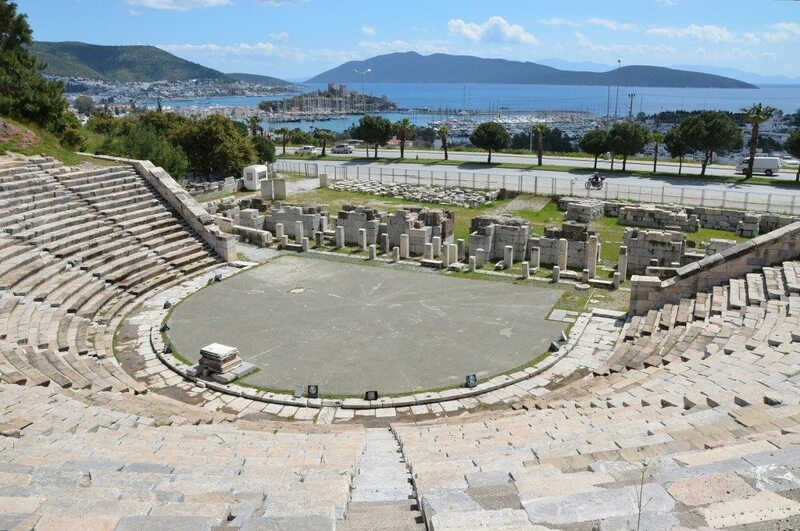 Just a short distance from the Mausoleum lies the theatre, the best preserved structure of ancient Halicarnassus. It is located 50 meters above sea level and overlooks the bay and the islands, providing a marvelous background for the spectators. 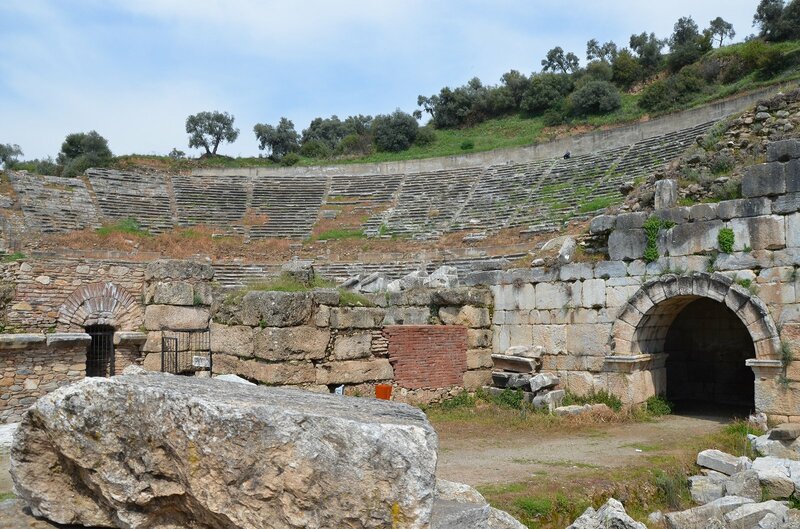 The theatre was built in the 4th century BC during Mausolus’ reign and was enlarged in the 2nd century AD. The original capacity of the theatre is estimated as 10,000 people whereas the present capacity is almost 4,000. 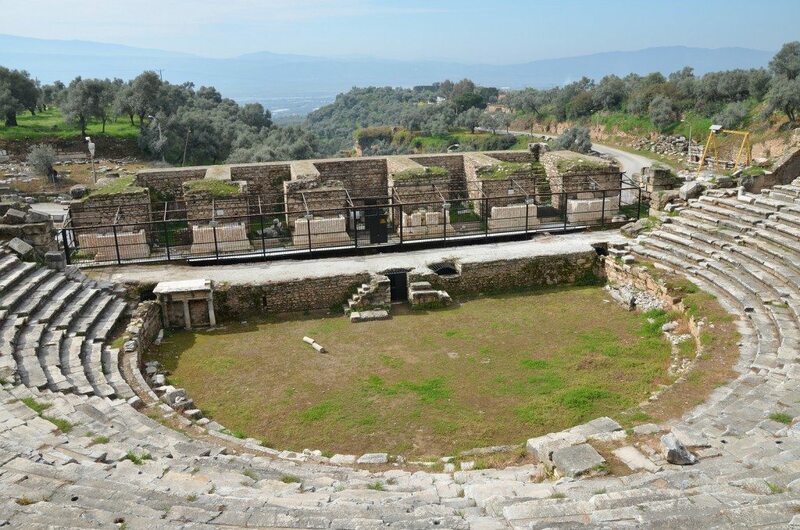 The theatre of ancient Halicarnassus, built in the 4th century BC during the reign of King Mausolos and enlarged in the 2nd century AD, the original capacity of the theatre was 10,000. Stratonicea was an inland city built on a plain near the sources of the river Marsyas. 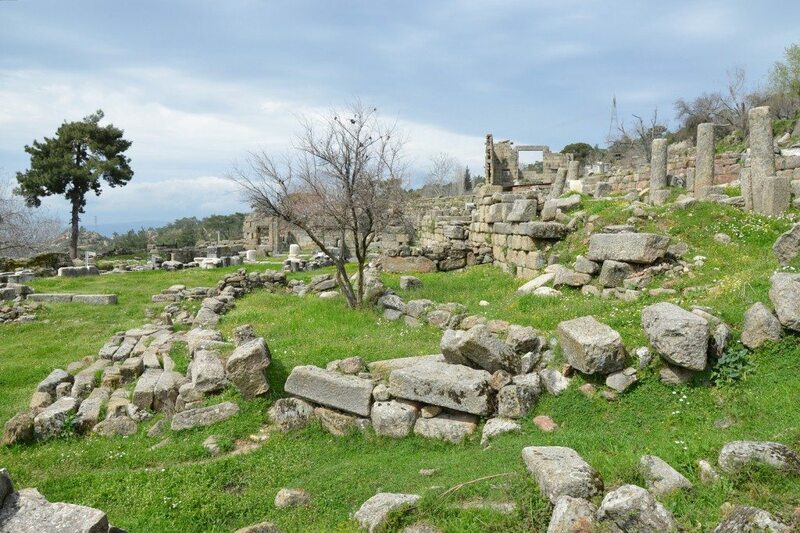 Today, the ruins of the ancient city are located in the abandoned village of Eskihisar, 28 km east of Milas. They lie among crumbling houses and deserted cottages which give travellers a feeling of mystery and enchantment. Stratonicea, which has been inhabited uninterruptedly for over 3,500 years, is considered as one of the world’s largest marble cities and is listed on Unesco’s tentative World Heritage Site list. Excavations are still ongoing around the site, exposing more and more of the forgotten city. This year’s excavations have unearthed many Byzantine-era tombs. Stratonicea was founded on the site of an old Carian town by the Seleucid king Antiochos I in the 3rd century BC. It was named in honour of his former stepmother and later wife Stratonice, a Syrian princess. Stratonicea was a thriving city during the period of the Seleucids, who, according to Strabo, adorned it with luxurious buildings. Later, the city was ceded to the Rhodians and in 200 BC it came under the control of the Macedon’s king Philip V for a short period of time. It was recovered by the Rhodians in 197 BC, keeping it until 167 BC when with the whole of Caria was declared free by the Roman Senate. The key monuments visible to the modern visitor include a large theatre fitting 10,000 spectators, a temple of Augustus, a colonnaded street lined by mosaics, a bouleuterion (council chamber) with multiple Roman inscriptions (including a copy of Diocletian’s Price Edict of 301 AD), and an enormous Hellenistic gymnasium. The gymnasium was built in the second quarter of the 2nd century BC to the west end of the city and was richly decorated in the Corinthian order. The total length of the building is estimated to 180 meters, making it the largest known gymnasium in antiquity. 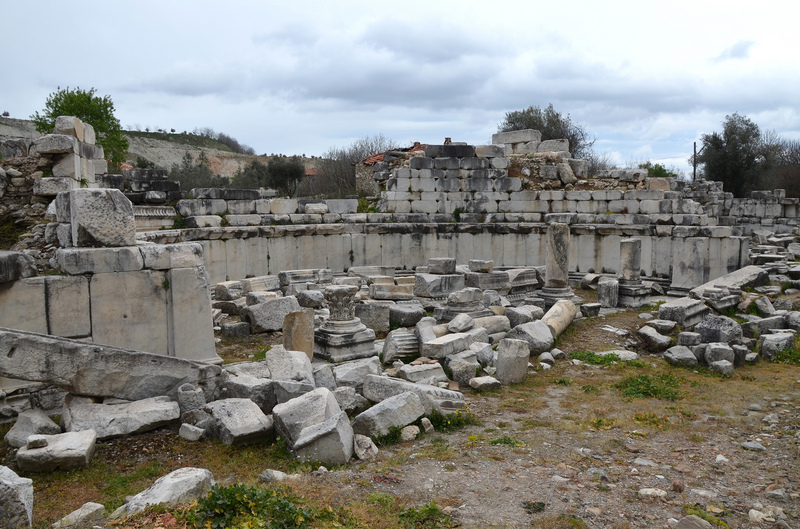 The ruins of the Ephebeion (where the Ephebes would receive instruction on Greek culture), part of the impressive Gymnasium built in the second quarter of the 2nd century BC to the west end of the city. The peripteral temple built in the Ionic order. It it is situated on the upper terrace above the cavea of the theatre and was probably dedicated to the Imperial cult of Augustus and Rome. The theatre, erected in the Hellenistic period in the north slope of the south hill, its capacity was approximately 10,000 spectators. 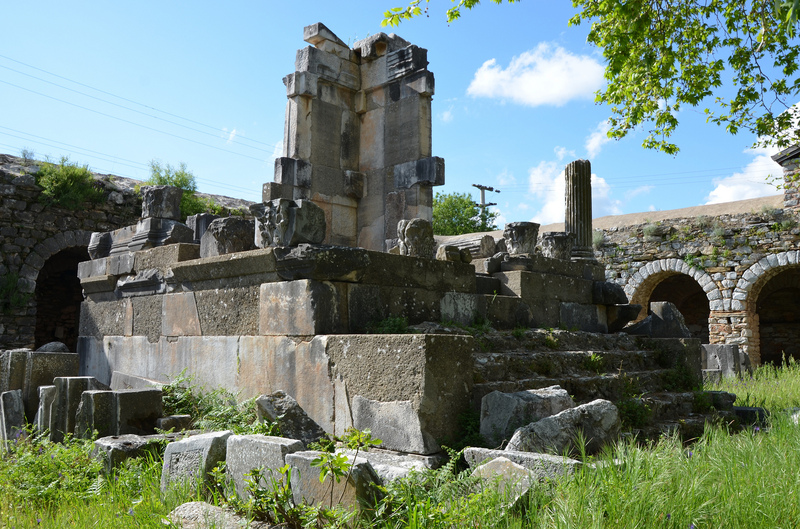 Just a few kilometers away from Stratonicea was the ancient city of Lagina, one of the most important Carian sanctuaries. A 11 km long road called the Sacred Way (ceremonial road) was connecting the two cities. The establishment of the sanctuary at Lagina as a religious centre dates back to the Seleucids but evidence from the necropolis implies that the origins of the settlement go back to the 7th century BC. The deity worshipped at the sanctuary was the goddess Hecate. She was the goddess of magic, witchcraft, the night, moon and was associated with crossroads and entrance-ways. In statuary, Hecate was often depicted in triple form, either with three bodies or three heads. Numerous festivals were celebrated at the site during which a procession delivered the key of the temple from Lagina to the bouleuterion in Stratonicea on which the rules of the religious celebrations of Hecate were written. 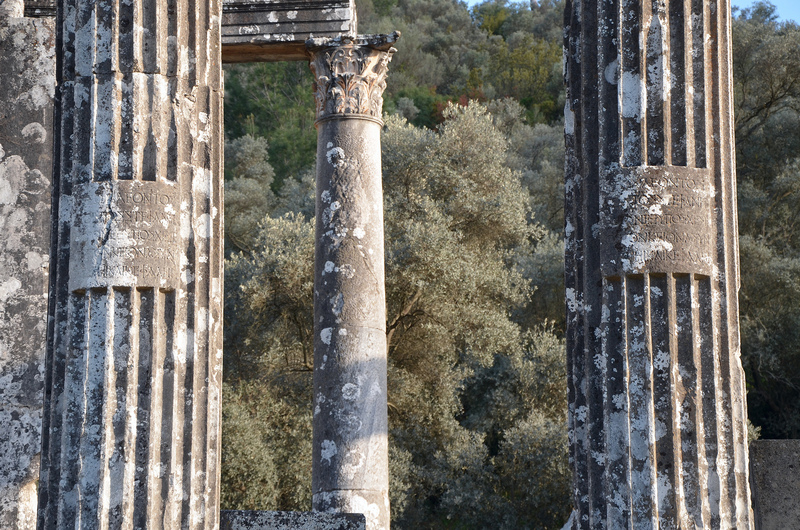 The Corinthian Temple of Hecate, its architectural type was pseudodipteral with pronaos. The sanctuary consisted in its centre of the famous Temple of Hecate. It was bordered by a wide temenos (the sacred area around a temple) surrounded by a stoa (a covered walkway) in the Doric order. The entrance was a propylaea (monumental gateway) with a semicircular colonnade at the front. A stairway with ten steps led from the propylaea to a paved way and then to the altar. The propylaea with a semicircular colonnade at the front. The propylaea, a stairway with ten steps led from the propylaea to a paved way and then to the altar. The Temple of Hecate, dated to the last quarter of the 2nd century AD, measured 21m x 28m and was built in the Corinthian order with 8 columns on its shorter sides and 11 columns on its longer sides. A frieze covered all four sides of the building. The reliefs are exhibited in the Istanbul Archaeology Museums and bear representations from the Greek and Carian mythology; scenes from the life of Zeus could be seen on the eastern frieze, the Gigantomachy (a battle between gods and giants) on the western frieze; on the southern frieze a gathering of Carian gods, and on the northern frieze the Amazonomachy, a battle between the Amazons and the Greeks. 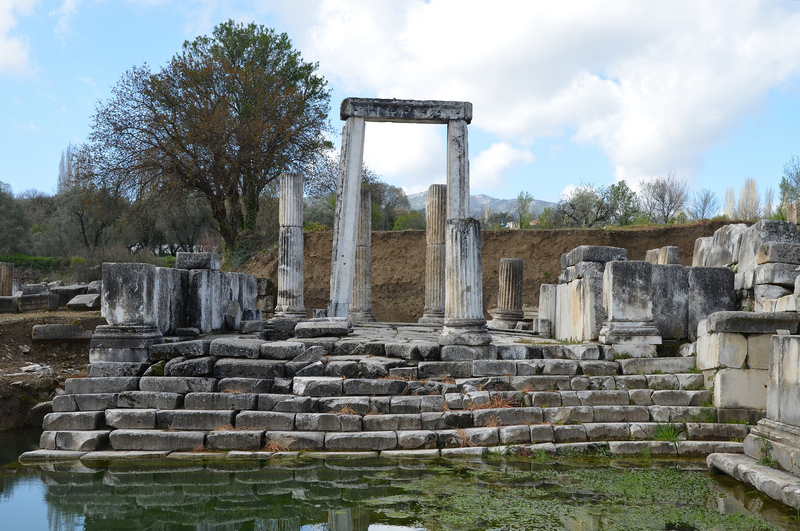 The Corinthian Temple of Hecate, Sanctuary of Hecate in Lagina. 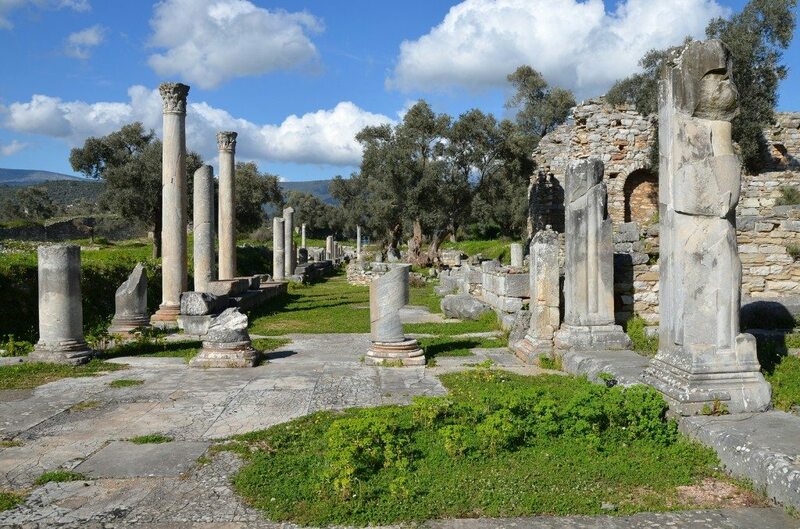 Nysa on the Maeander is a true gem of Caria hidden in the deep valleys of the Aegean. 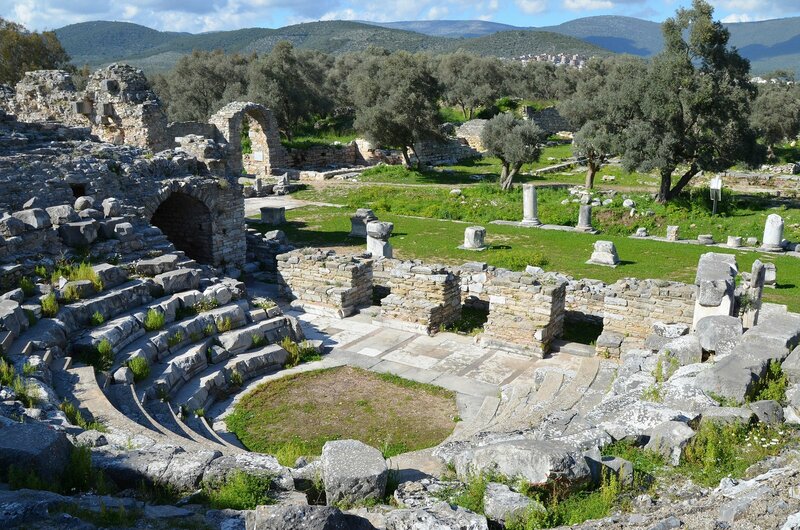 An important Carian center, the ancient city was located in the north of the region, 50 kilometres east of the Ionian city of Ephesus. Today, it is a well-preserved archaeological site. 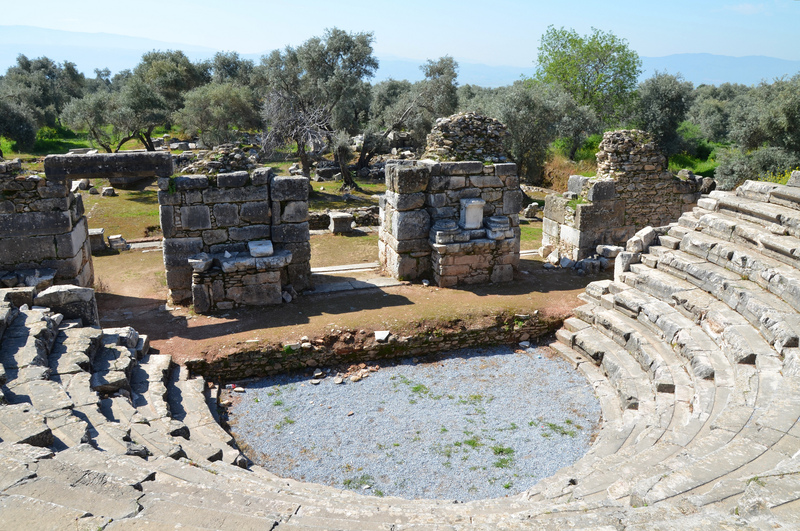 Nysa is said to have been the name of the place in which the god Dionysus was born and raised. The city rose to prominence under the Romans and was home for a while to the historian Strabo (63 BC – 25 AD). Strabo described the city as three towns rolled into one. 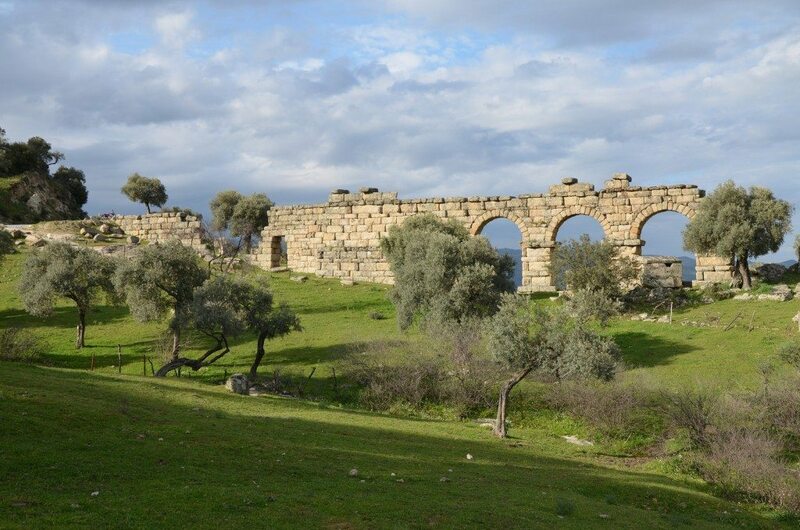 He mentioned that it was originally called Athymbra but by the 2nd century BC the settlement appears to have been renamed Nysa, possibly in honor of the wife of King Antiochus I Soter. Nysa was planned as a city composing of two separate sections, situated on both sides of a mountain cliff. 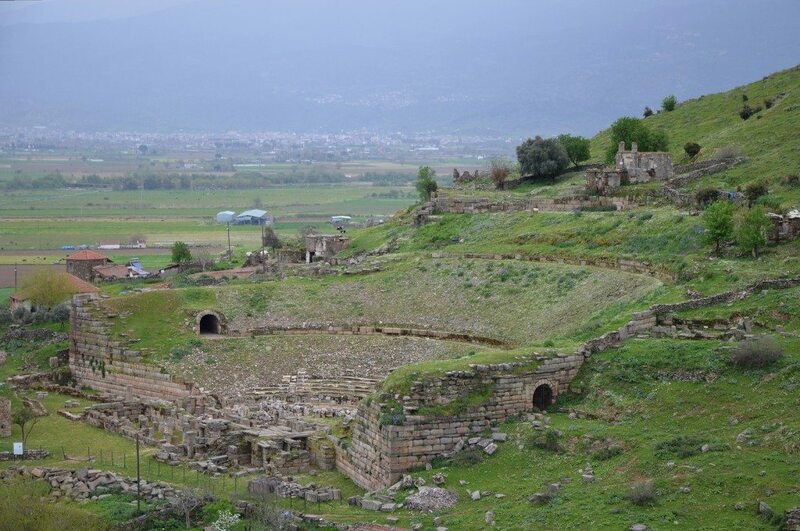 There are important ruins scattered on the mountain slope from the Hellenistic, Roman, and Byzantine periods. The well-preserved theatre, rebuilt during the Roman Imperial period, is famous for its friezes depicting the life of Dionysus and the sacred marriage (theogamia) between Persephone (daughter of the goddess Demeter) and the god of the Underworld, Pluto. With its 35 rows of marble seats, it had a capacity of 12,000 people. The theatre of Nysa, first built in the Late Hellenistic period but the current architectural features date to the 2nd century AD. The Stadium of Nysa, built at the foot of the gorge with rows of seats cut into the steep hillside and dated to Late Hellenistic period. The library of Nysa, built in the 2nd century AD and considered to be Turkey’s second-best preserved ancient library structure after the “Celsus Library” of Ephesus. The gerontikon (Council House of the Elders) of Nysa, originally built during the Hellenistic and adapted as an odeon in the 2nd century AD, the capacity was 700. Other significant structures include the Agora (market place), the Gymnasium and the Roman baths. 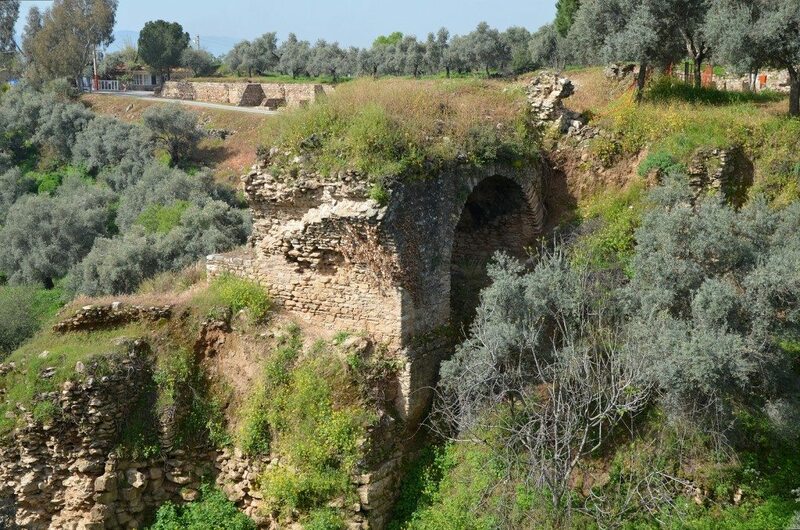 The 100 m long Nysa Bridge, a tunnel-like substructure, was the second largest of its kind in antiquity, only surpassed by the nearby Bridge at Pergamon. The street leading to the entrance to the Agora of Nysa. The east portico of the Agora (market place) of Nysa. 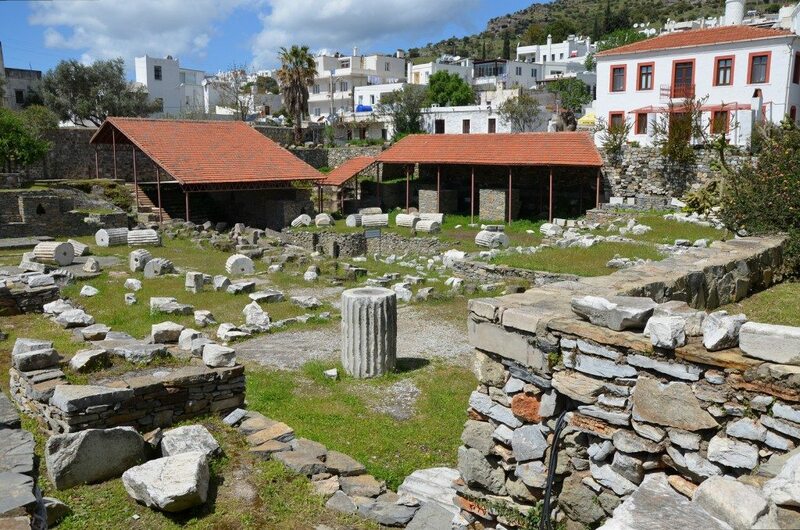 The Agora covered an area of 113 x 130 meters. 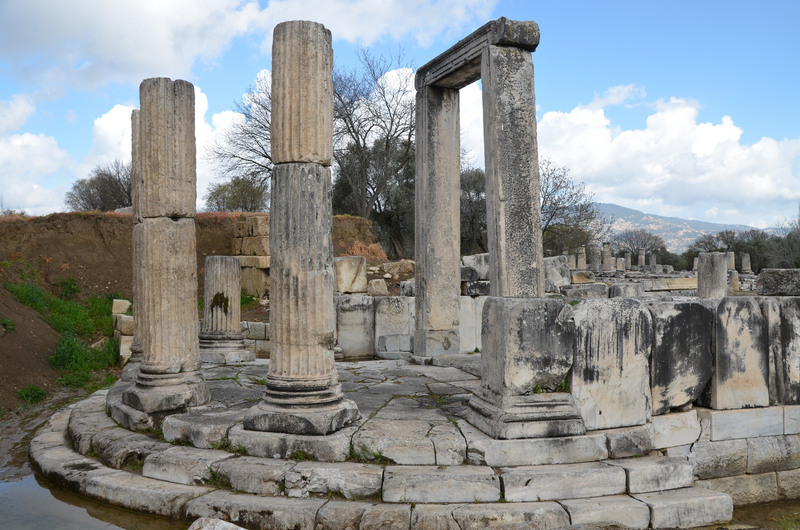 The first construction phase of the Agora is dated back to Late Hellenistic Period. The late imperial Roman bridge of Nysa. The 100 m (328 ft) long substructure was the second largest of its kind in antiquity after the Pergamon Bridge. 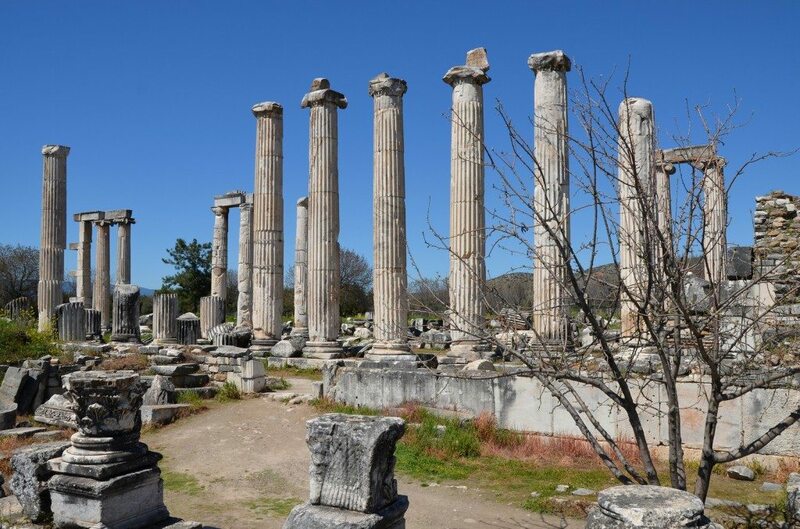 Located in the ancient city of Euromos in today’s Muğla’s Milas district, the Temple of Zeus Lepsynos is one of the best preserved temples in Turkey (another one is the Temple of Zeus in Aizanoi in Phrygia). 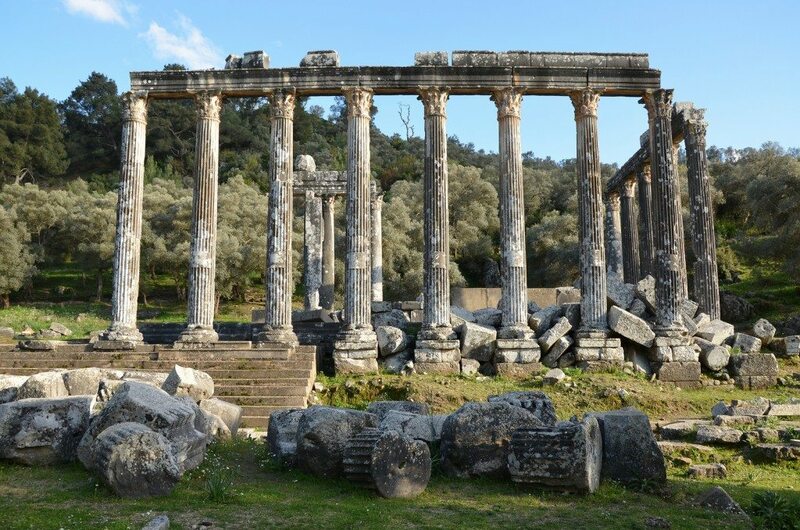 It was built during the reign of Emperor Hadrian in the 2nd century AD on the site of an earlier Carian temple (the temenos itself dates back to as early as the 6th century BC). However the temple was never entirely completed (some of the standing columns were never fluted), probably due to the economic crisis that hit the ancient city 1,800 years ago. Wealthy citizens stepped forward with financial support and had their names engraved on plaques on some of the columns, but this support was insufficient. An inscription says that Menecrates, a physician and magistrate donated five of the 30 columns of this temple and Leo Quintus, a magistrate donated another seven. Temple of Zeus Lepsynos at Euromos, built in the 2nd century AD on the site of an earlier Carian temple. Inscriptions on the flutted columns of the Temple of Zeus Lepsynos celebrating the donors who financially supported the construction of the temple. In the 5th century BC city of Euromos (meaning “strong”) was one of the most important Carian cities after Mylasa. 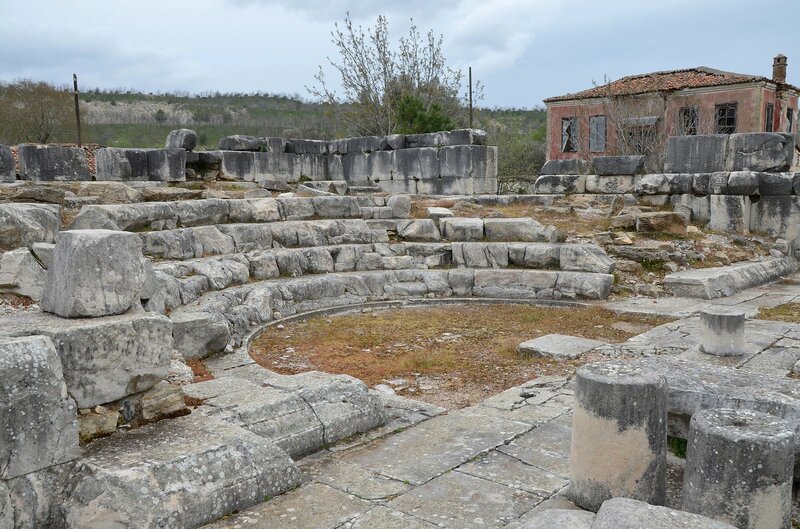 It had a theatre – traces of which are still visible – and a rectangular agora with colonnaded stoas on each side. The Temple of Zeus stood just outside the city walls to the south. It was built in the Corinthian order and had six columns on its short sides and eleven columns on its long sides. Today, sixteen columns are still standing. Small scale excavations began in 1969 and are continuing. A group of archaeologists from Turkey are currently planning to restore the temple and re-erect some of the fallen columns. 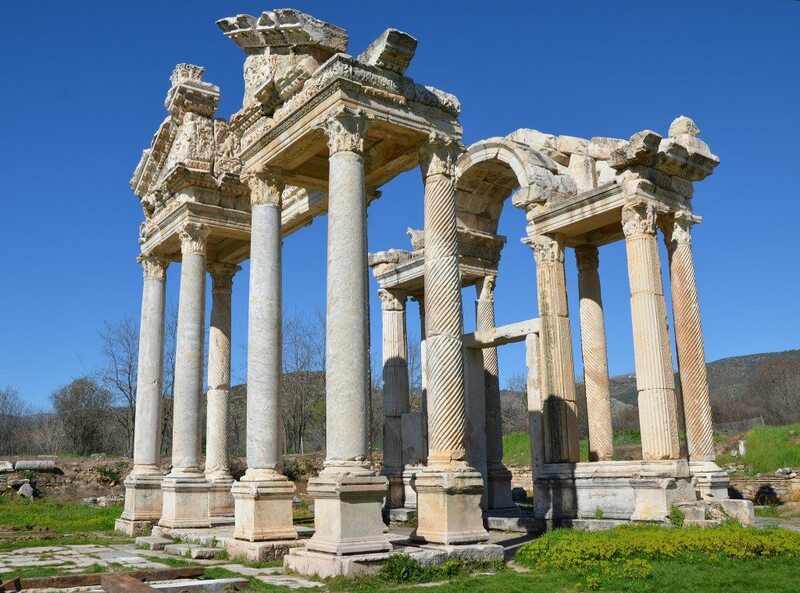 Alabanda, located about 7 kilometers west of the present town of Çine in the Aydin province, was founded in the fourth century BC. The city was said to derive its name from the hero Alabandus, who allegedly got his name after winning a horse race. Alabanda is a combination of the Carian words ala (meaning horse) and banda (meaning victory). 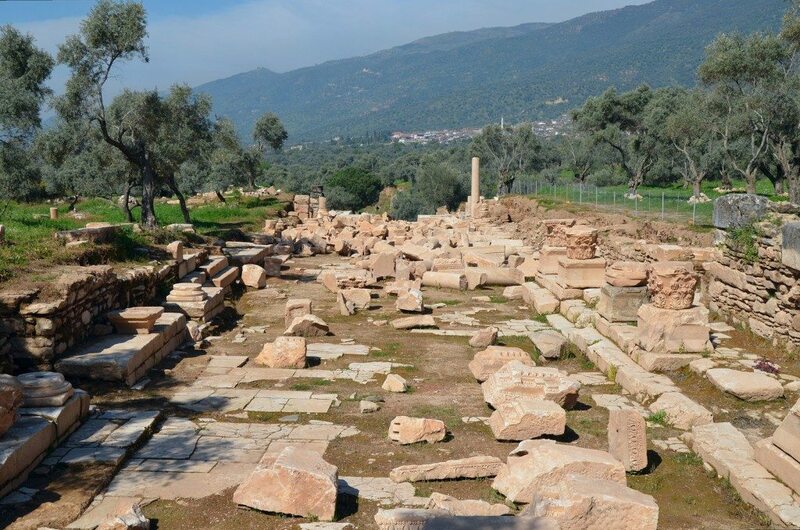 Excavations carried out in the 20th century have brought to light the foundations of two temples, a Hellenistic theatre, a rectangular bouleuterion and a gymnasium-bath complex. 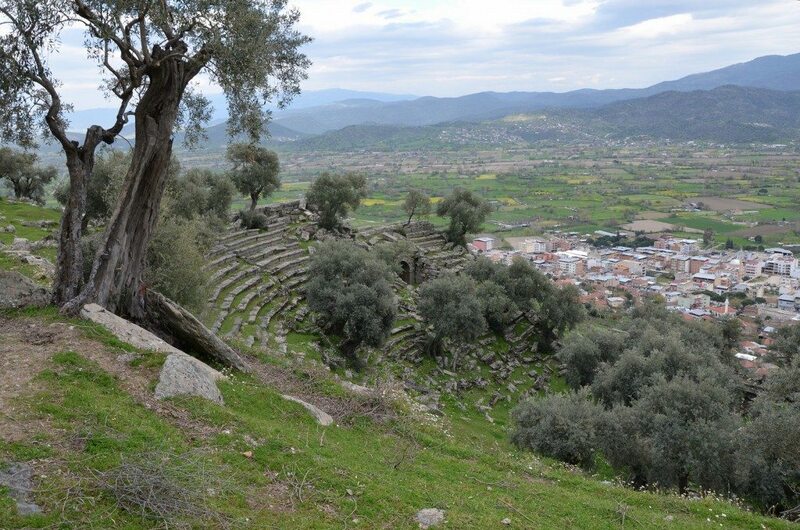 The Hellenistic theatre of Alabanda, located on a natural south-facing hillside. The theatre could hold 6,000 spectators in its early phase. In the Imperial period, gladiator and animal combats were increasingly in demand and a new design was created to fill these needs. The first of these temples is the Temple of Apollo Isotimos. It was built in the second century BC in the Ionic order and had thirteen white marble columns on each side and eight at the front and back. Four slabs of a frieze depicting a battle between the Greeks and the Amazons (Amazonomachy) were found at this site as well as an inscription indicating that the temple was rededicated to Apollo Isotimos and the Divine Emperors in Imperial times. The ruins of the Ionic Temple of Apollo Isotimos in Alabanda, built in the 2nd century BC. The second temple stood on the slope of the hill, a little above the plain. It was Doric in style with six columns on its short sides and eleven on its long sides. 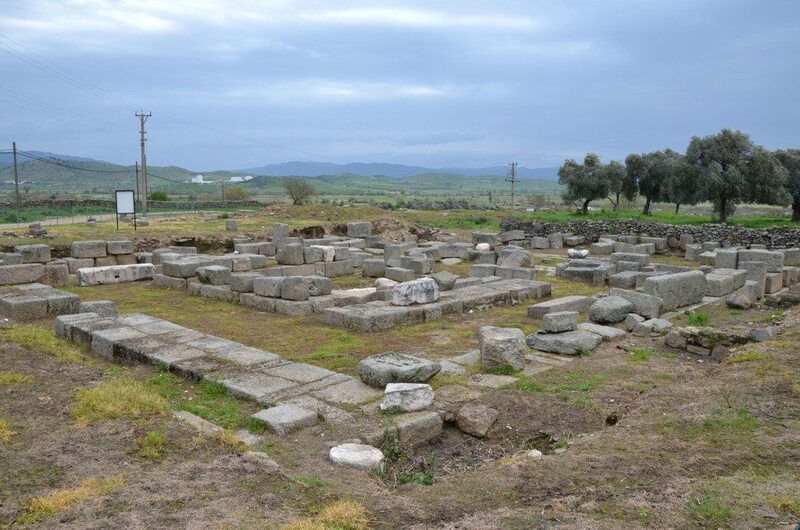 It was commonly known as the Temple of Artemis after a figurine of Artemis-Hekate was found on the site, but in 2011 a group of excavators discovered an altar with a labrys (doubleheaded axe), an attribute of the Carian god Zeus Chrysaoreus (Zeus of the golden sword) which identifies the building as a temple dedicated to this god. 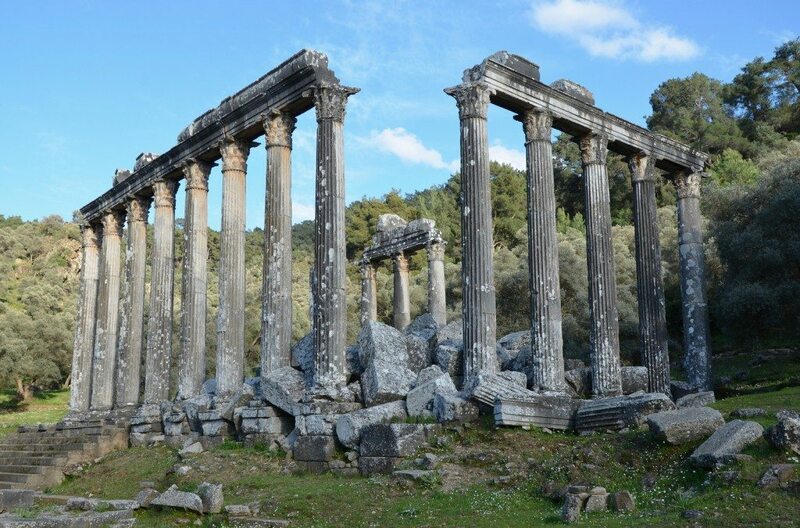 The Doric Temple of Zeus Chrysaoreus in Alabanda, built in the 3rd century BC. 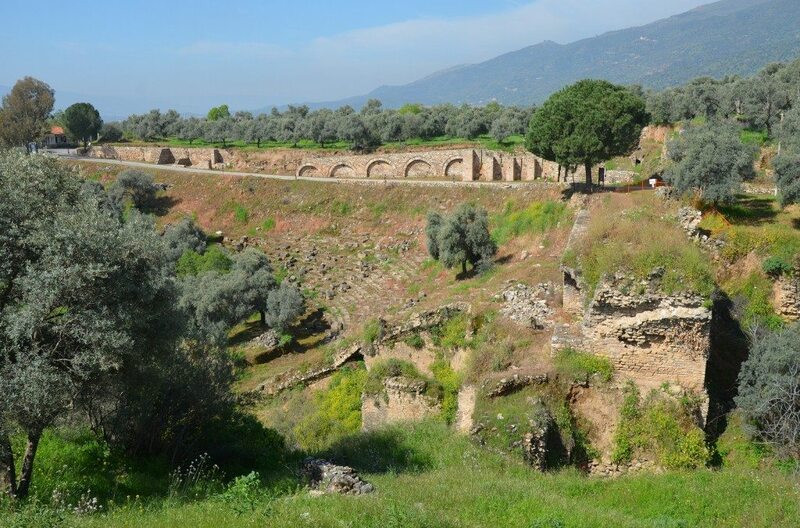 Alinda, located near the site of ancient Alabanda, is where the famous encounter between Alexander the Great and Ada of Caria occurred towards the end of the 4th century BC. With this event, Alinda made a dramatic appearance in the history of Caria. 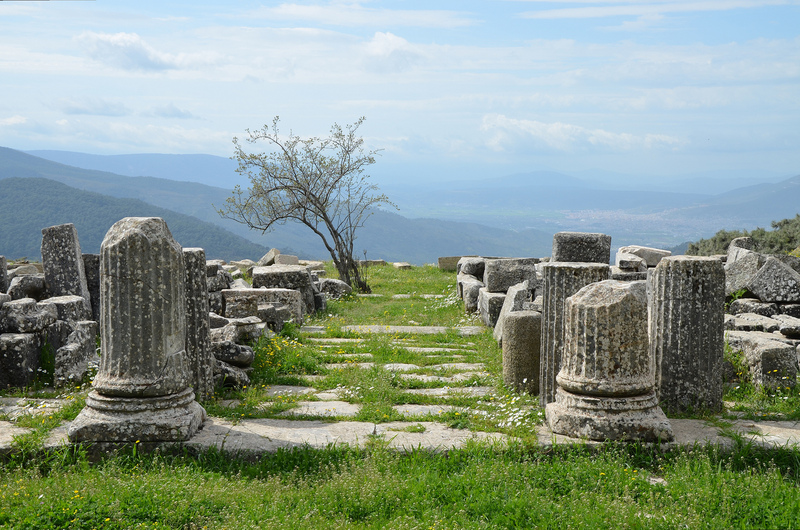 The ruins of Alinda are situated on a hilltop overlooking a fertile plain above the village of Karpuzlu. 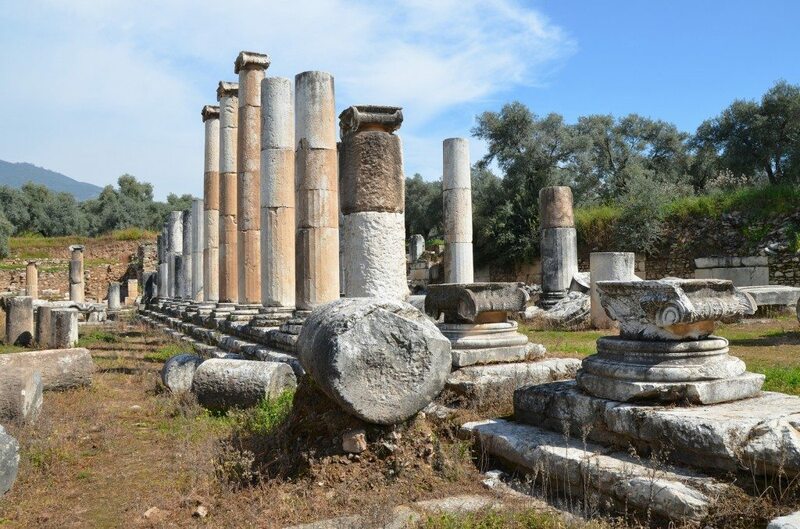 Several parts of the city walls, the theatre and some of the towers are in good state of preservation but the most outstanding of Alinda’s ruins are the remains of the huge Hellenistic Agora. It is over 90 meters long and was originally composed of three-storeys, of which the lower two are well-preserved. 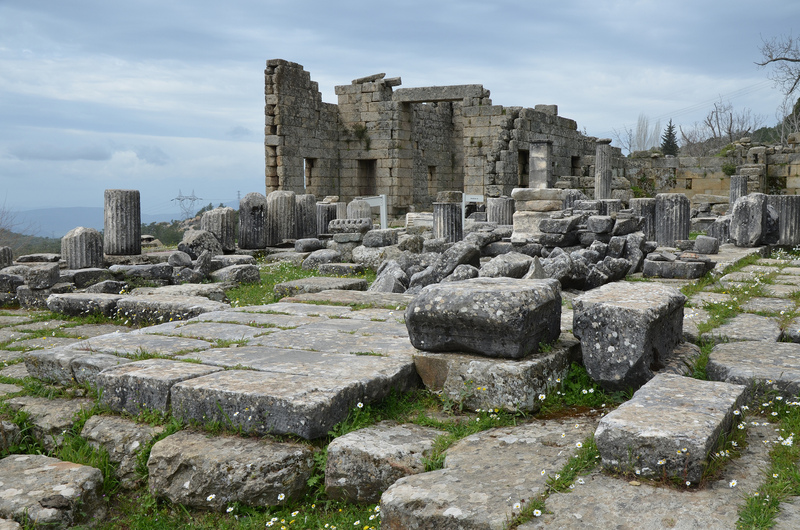 The ruins of the Hellenistic three-storey Agora of Alinda. The early 2nd century BC theatre, retaining two galleries and most of its seats, is also in good state of preservation but mostly overrun by vegetation and olive trees. Facing south, the theatre gives an outstanding view over Karpuzlu and the valley below. It had a seating capacity of approximately 3,400 people. 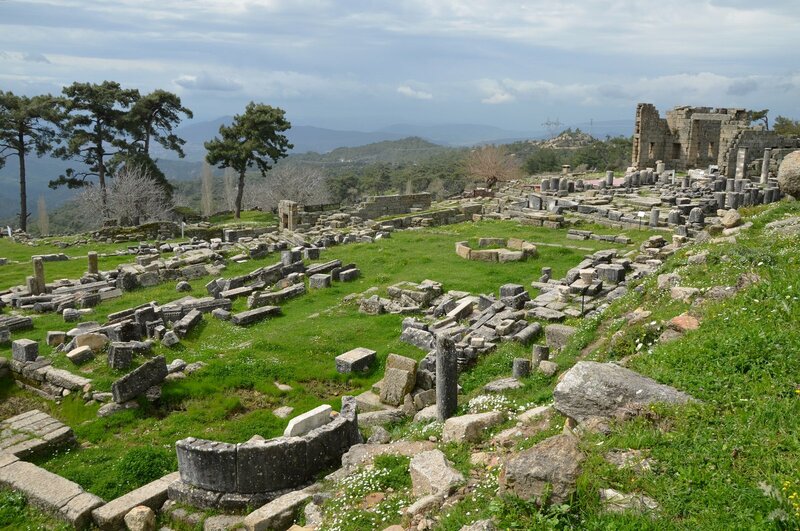 The ancient Greek city of Iassos is an extensive multi-period site located on the shores of the Iassos gulf (Gulf of Güllük) halfway between Didyma to the north and Halicarnassus to the south. Once situated on an island, the city is now joined to the mainland, creating a peninsula. According to tradition, Iasos was colonized, possibly in the 9th or 8th century BC, by Greeks from Argos (the Dorians) but archaeological evidence shows that the site of Iassos had been inhabited since the Neolithic period and that it flourished as one of the great Minoan and Mycenaean settlements in Asia Minor. Prosperity continued throughout the Hellenistic, Roman and Byzantine periods and many of the remains date from the later periods. The Bouleuterion of Iassos, dated to around the end of the 1st century AD (the original building was probably erected in the 4th century BC). Its capacity has been estimated to 960 spectators. The scaena (stage) of the Bouleuterion of Iassos decorated with opus sectile (marble inlay). Twentieth century excavations have revealed the Agora (the civic center), which remains date to Hadrian and Antoninus Pius’ times, the bouleuterion (council house), one of the best preserved buildings in Iassos, temples which included a sanctuary dedicated to Artemis Astias (the patron-goddess of the city) and numerous other buildings. 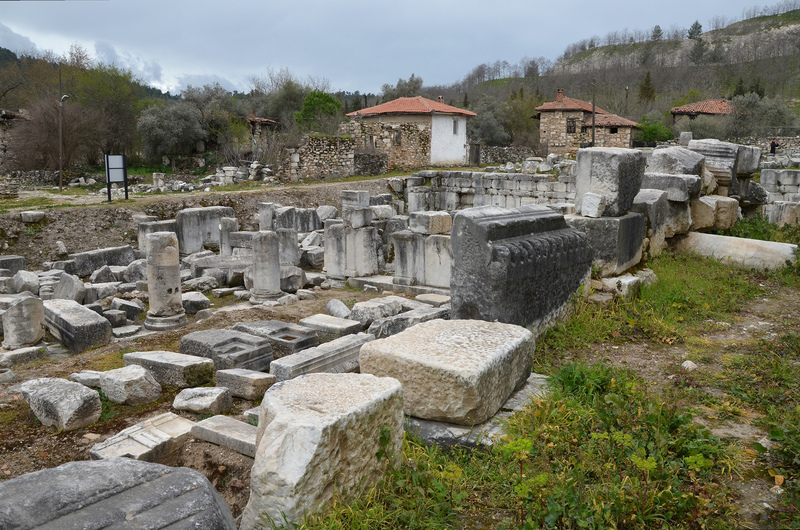 Today the site of the Agora is full of monuments and graves of the Byzantine period. 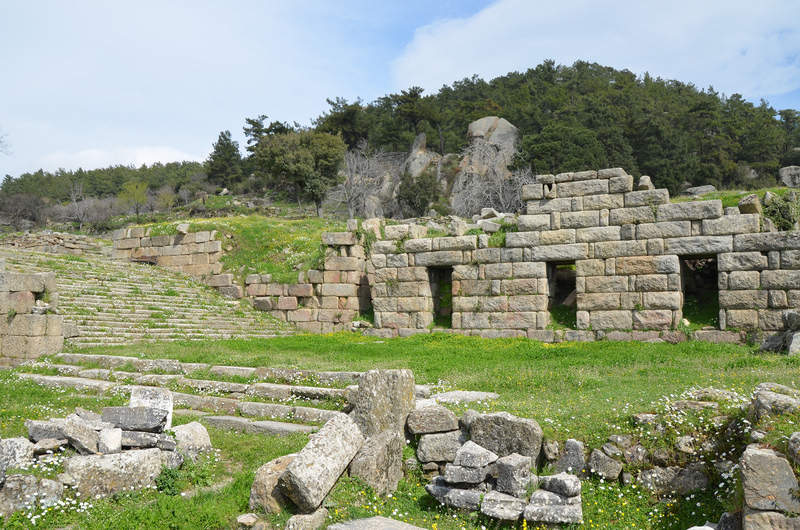 The Agora of Iassos, reconstructed mainly during Hadrian’s time, its initial building must have started in the 4th century BC. A funerary monument in the form of a Corinthian temple is a very impressive construction dating from the Roman period. It is located inside the courtyard of the “Old Fish Market” which was restored to be used as an open air museum in 1995. 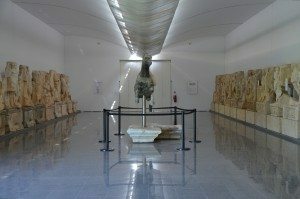 The monumental Roman tomb inside the Iassos Museum (the old fish market). It had the appearance of a small Corinthian temple on a very high podium.